A Pentagon project to harvest and reuse parts from dead satellites is gaining steam, and a new video shows how the far the military program has come in its first few months. The new video serves as a progress report through last November for the Phoenix program, a project by the Defense Advanced Research Projects Agency (DARPA) to recycle space junk back into valuable satellite parts, or even completely new spacecraft. DARPA scientists began the project in July and are working toward launching the first demonstration mission in two years or so. "Today, satellites are not built to be modified or repaired in space," Phoenix program manager Dave Barnhart said in a statement unveiling the video Tuesday (Jan. 22). "Therefore, to enable an architecture that can reuse or repurpose on-orbit components requires us to create new technologies and new capabilities. This progress report gives the community a better sense of how we are doing on the challenges we may face and the technologies needed to help us meet our goals." This progress includes the development and testing of prototype satellite-grappling technology and tele-operations control software, among other gear, according to the video. Defense Advanced Research Projects Agency (DARPA) describes the Phoenix program: "The goal of the Phoenix program is to develop and demonstrate technologies to cooperatively harvest and re-use valuable components from retired, nonworking satellites in GEO and demonstrate the ability to create new space systems at greatly reduced cost." The Phoenix program plans to use a robot mechanic to grab still-working antennas from the many retired and dead satellites in geosynchronous orbit, about 22,000 miles (35,406 kilometers) above Earth. 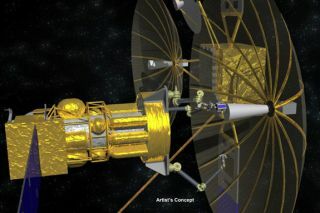 These large, bulky antennas would then be attached to small "satlets," or nanosatellites, launched from Earth, creating new space systems on the cheap. The goal is to demonstrate a way to turn part of the ever-expanding cloud of space junk around our planet into space resources, saving money in the process, DARPA officials have said. The first on-orbit demonstration mission is targeted for 2015. "We have a long way to go, but we are laying the foundation for improving how we build space systems, with the goal of changing the economic model for space operations," Barnhart said. Phoenix isn't the only satellite-servicing effort currently underway. NASA's Robotic Refueling Mission (RRM), which was delivered to the International Space Station in July 2011, is testing out the technology necessary to repair and refuel satellites on orbit. The latest round of RRM experiments is going on right now, with the space station's two-armed Dextre robot attempting to snip wires, unscrew caps and pump simulated fuel using the RRM test module, NASA officials have said.